‘Every Day A Friday’ is Joel Osteen’s response to studies that show we’re happier on Fridays - he wants us to experience this happiness every day, not just one day a week. Joel describes how changing our mindset can lead to greater happiness. In seven parts, he carefully explains how we might adopt a different attitude, resulting in living happier lives. Joel’s stories illustrate the points he makes very well, getting his message across clearly and memorably. 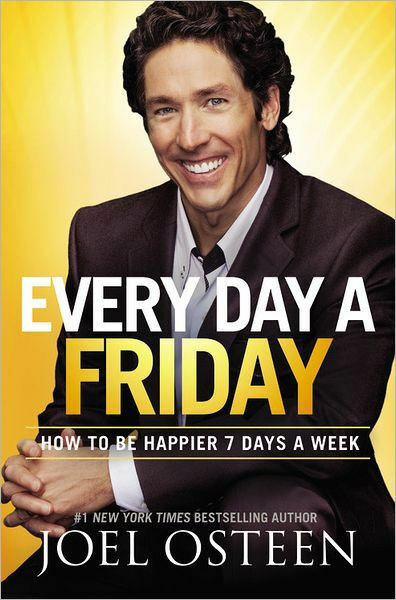 Every Day A Friday by Joel Osteen was published by Hodder and Stoughton in October 2011 and is our 7706th best seller. The ISBN for Every Day A Friday is 9781455503834. Be the first to review Every Day A Friday ! Got a question? No problem! Just click here to ask us about Every Day A Friday . Pastor Joel Osteen writes how we can generate this level of contentment and joy every day of the week. Known as a man who maintains a constant positive outlook in spite of circumstances, Osteen has described this message as a core theme of his ministry. The title comes from research that shows people are happiest on Fridays. Combining his personal experiences with scriptural insights and principles for true happiness, he shows readers how every day can hold the same promise and opportunities for pure joy that they experience at five o'clock on Friday. EDEN ARTICLE: IS FRIDAY ON EARTH HAPPIER THAN SUNDAY IN HEAVEN? Joel Osteen starts his ‘Every Day A Friday’ video with the observation that people are ‘10% happier on Fridays’. It’s the sort of thing we all ‘know’ to be true from our own experience – we don’t need statistics to back it up. However, now that we know Fridays are 10% happier, how much happier are Saturdays and Sundays? And assuming that weekend days are significantly happier than weekdays, why hasn’t he written a book called ‘Everyday A Saturday or A Sunday’… or a Bank Holiday Monday, Christmas Day or the most obvious Christian ‘happy day’ of all, Easter Sunday? The answer might be in what Joel Osteen – and you and I, think is special or at least different about Friday. I’m guessing that Osteen is relating his title to the ‘traditional’ 5 day week working culture of the fast disappearing western industrialised society. If you work some kind of rolling shift pattern, work for yourself or can’t find work at all, then this title might not be as inspiring as the author hopes. But supposing that you do have a ‘standard’ 9 to 5 Monday to Friday working week, then what is Friday? It’s the last day of work; so why should that make you 10% happier? Joel seems to be assuming that we don’t actually enjoy work – which again raises the question I started with, why don’t we try to make ‘Every Day a Weekend Day’ instead? Assuming this increasingly unrealistic working pattern, then Friday has something that no other day of the week has – including weekend days. I’d suggest that what that is, is potential; it has something to look forward to that hasn’t happened yet. On Friday we can have expectations as yet unrealised. We can imagine a weekend that’s perfect – as relaxing as we need, as satisfying as we hope and as fulfilling as we want it to be. Of course, when it comes – and when it’s gone, the weekend isn’t always everything we wanted it to be. But it doesn’t stop us being equally hopeful when the next Friday comes along. It seems to me that there’s nothing human beings enjoy more than the imagined future. So what does that say about Christians and our hope of heaven? Joel Osteen always seems to be smiling - try testing this by searching him in Google images. I tried this, expecting to find some pictures revealing that even Joel can become sad and frustrated and let these feelings show up on his face. I did find some pictures where he wasn’t smiling, but these were usually action shots of him praying or preaching, and even then he seemed to be repressing a smile as he used his expressions to communicate. In an interview Piers Morgan called Joel and Victoria Osteen ‘the squeakiest, cleanest people I’ve ever met in my life’ - this wouldn’t be surprising as Morgan has spent much of his career working for News of the World. However, he does raise a point about the Osteens that relates to their apparent integrity - do they practice what they preach? ...On balance, I think they do. For Joel Osteen, it’s all about the relationship between words and life. Known globally for his encouraging sermons, Joel focuses on the positives and doesn’t get hung up on difficult theological issues. He does this, I think, because of two main reasons: 1. Joel recognises that without in-depth study and theological training, his authority to comment on complex theological issues is limited. 2. Joel believes in the power of speaking positivity over his congregation as means of bringing about God’s promises, constantly affirming and building up those who hear him. ‘I Declare’ is a book in which Joel shares his insight into this area, first explaining the concept in the introduction ‘Here’s the key; you’ve got to send out words in the direction you want your life to go. You cannot talk defeat and expect to have victory.’ In the introduction Joel tells the story of a doctor who instructed his patients to say, three or four times an hour, ‘I’m getting better and better every day in every way’. Even though the statement was completely baseless, the results were phenomenal. How much more could speaking God’s promises over your life bring about His blessing? "Joel Osteen is a man of mindset - his perma-smile is an accurate reflection of the positive way in which he approaches life. Osteen ‘chooses’ happiness, intentionally deciding and determining that his day will be one of blessing and happiness. Most of us have happiness that is reactive in nature - it’s level changes from situation to situation, from day to day. Recent studies have shown that working adults are usually happier on a Friday. Joel’s book ‘Every Day A Friday’ is about rearranging your mind so you can effectively choose happiness, living each day as happy as you are on a Friday."